When it comes to measuring the success or failure of any online campaign people always want to see the numbers. How many visitors came to the site, how many fans do you have on Facebook, and my favourite, how many people did you “reach” on Twitter. While a lot of the time these numbers can show part of the story, they don’t always tell the whole thing. Followers: With Twitter, the biggest way to fudge numbers is with the size of your following. This means how many people clicked that blue FOLLOW button on your profile. Sure, it may seem like the best measurement of someone’s “influence”, but have you really taken the time to analyze the following. Things you want to consider are: are the users real (yes, you can buy fake followers), are most of them businesses, are they contest whores only following because they entered a contest once, do they mostly have similar follow to following ratios (not always 100% because many times people just follow others and then unfollow if they don’t get the follow back), and are they even in the same country or relevant to what the person talks most about? The easiest way to figure out if the person’s following is legit is to look at their engagement. Are people retweeting their content, replying to it, or clicking the favourite button? If not, then chances are they either produce low quality content, or the majority of their following isn’t as “real” as you think it might be. It is easy to fake following, trust me, I’ve done some stuff that can do it easily! People use these tactics to grow their following because it can get you a lot of great things for FREE! Invites to parties, free products, trips, phones and much more, but trust me, 3500+ people didn’t just follow me because I am amazing. I have a following of this size because I have tried some of these tricks (mainly the contests and unfollowing some people that didn’t engage back) to grow my following. It isn’t such a bad thing, but there is a huge difference between me and the guy who actually got 3500 people following that are waiting for his every tweet. Just look at the person’s engagement and you should be able to figure it out pretty quickly. As Scott mentions, it is a stat that really cannot be measured, because there is NO WAY of actually telling how many people saw an individual tweet. As I mentioned above, I have 3500+ followers. The likelihood of even 1% of them seeing a single tweet is very small as many of the people following me are following many other people, and also not online 24/7 reading their Twitter feeds. Even if they are, there is a good chance that they are scrolling so fast that they might not even see my content. The way Twitter reach is calculated is as follows: Number of combined followers (including those on retweets) x # of tweets. Therefore, if I made 5 tweets using a single hashtag I could say my tweets had a reach of 17,500 people (3500 followers x 5 tweets). Really, all I am doing is attempting to reach the same 3500 people, 5 times. Reach also doesn’t take into consideration similar followers. So, if I tweet something and it is retweeted by someone with the same number of followers who are all the same followers as me, it doesn’t mean the reach is now 7000. 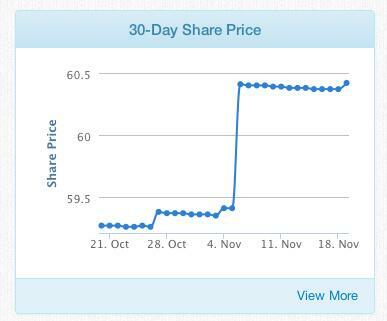 It just means it potentially was seen by 3501 people. Next time someone says that their campaign reached 6,000,000 people, ask them to provide you with a list of names of each of those 6,000,000 that saw their tweet. Instead of reach, look at engagement stats. How many people replied to the tweets, how many people acted on the message, how many people shared the info with their friends. These are the true measures of whether something was actually important to that person’s following. Fans: Fans are so easy to fake on Facebook. For just $5 I did a study where I took a page from about 20 fans to over 5000! While this may look to an unsuspecting eye that I have a lot of fans, it doesn’t mean a thing. It has since dropped down to under 1900 as Facebook starts to figure out a large number of these accounts aren’t real, but this is still a significant number of fans to a potential advertiser. 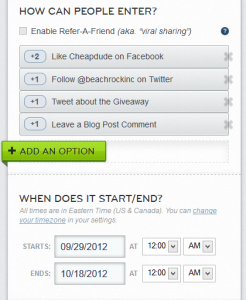 Another way to quickly grow a Facebook account is by using contests. While most of these people probably won’t unlike the page later, it will be very difficult to get engagement out of them, assuming the account they liked your page with wasn’t one they just set up for contests. If you want to easily figure out if LIKES are fake, just look at what percentage of their fans are interacting with the posts made by the account. As mentioned above, contests are a great way to artificially inflate your following. Another thing that you can do with contests is make them appear to be even more successful than they actually were! For example, if I were to show you these two contests that I did on my blog CheapDude.com, which would you say was more successful? At first glance you might think Contest #2 had way more people, because it has more entries. While this would normally make sense, you really need to look behind the scenes to determine what actually is considered an “entry”. As you can see above, people who entered contest #2 got WAY more entries, and it reflected in the number of entries section in the first image. 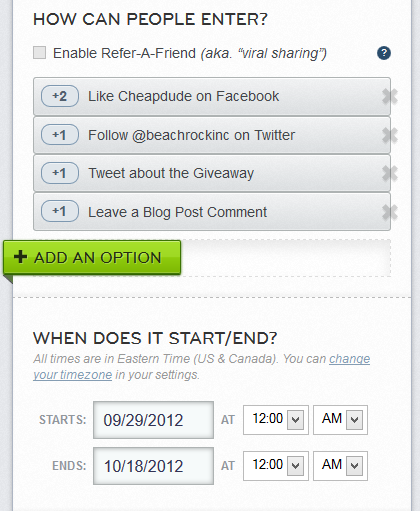 Contest #1 ran longer giving each person more opportunities to complete the tasks that allowed them to re-enter daily. 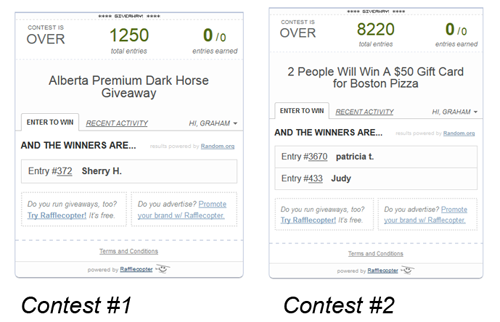 The results: Contest #1 had just over 400 unique people enter over the 2 week period, while Contest #2 had only 267 unique entries making Contest #1 much more successful. This is just something to consider when you see a contest that had over 5000 entries. Traffic to a website is a bit trickier to fake, but it still can be done. Contests are a great way to drive up numbers on a website, which I experienced while running the contests mentioned above. Stumbleupon is another way to get a huge boost in traffic, but it is mostly very poor quality. When looking at someone’s traffic stats it is important to always look at unique visitors over just visitors, how many pages are being viewed per visit (this will help you to determine if they had one page on the site that went viral to massively increase numbers), time spent on the site, where the visitors are coming from, and how long they are spending on the site. All of these will help you determine how accurate the numbers really are. When ever someone tells you a number to try to convince you to do something, ask them what it really means. If other things don’t add up to back the numbers up, or something seems suspicious, it probably is. If you are ever confused with some numbers you are being presented and want a second set of eyes on it, just message me on Twitter at my account @beachrockinc. Nice job telling it like it is Graham! 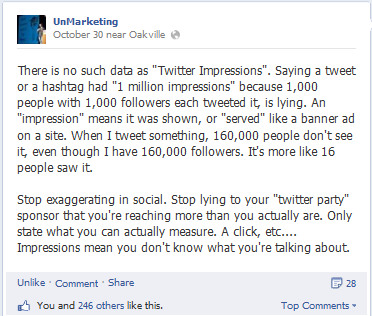 Twitter impressions has got to be the dumbest metric out there. 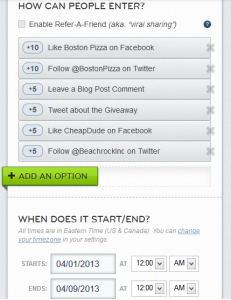 Contests can be an effective way to grow a real audience. The key is to choose a prize that is highly valuable to your target audience and no one else. Most people don’t understand this. They think they can build a lucrative business for the price of an ipad that they give away. Very good point Casandra, though it isn’t always possible and some people will enter any contest just because there is a contest. There are many sites set up just for contest whores and many people make a living from contests selling away the prizes they win. But it definitely helps weed out some!